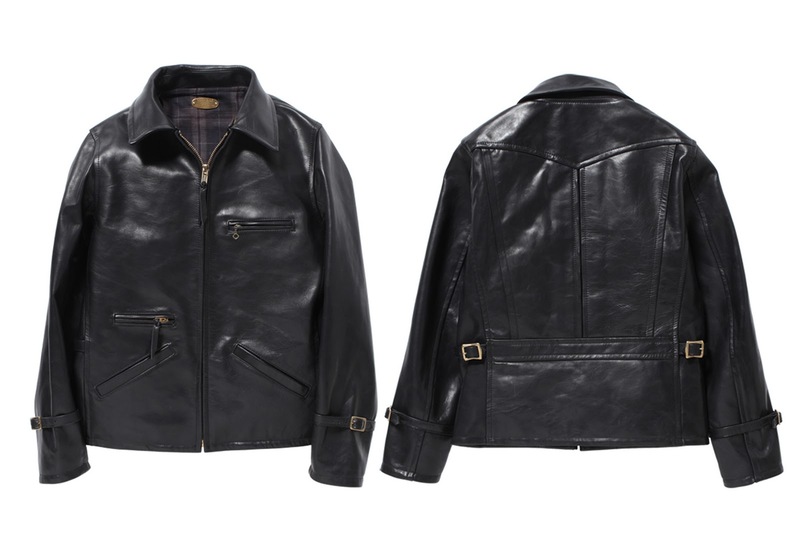 Stevenson Overall Company's beautiful vintage remake of the classic 1940's era Leather Sports Jacket using the finest Japanese horsehide leather and lined with equally fine quality Japanese slub plaid cotton. Patterns and shapes have been thoughtfully reworked and redrawn for a less "boxy" silhouette in order to better fit the modern man and lifestyle. Pleated "action back" allows mobility even with the modern tighter fit. Half-belt back construction with adjustable side buckles for great fit & style along with classic multiple panel back design. Cuff cinch with buckle, deadstock talon pocket zippers and front zipper with matching leather pull, underarm vent grommets and gold plated name tag are just a few of the many nice details on these great jackets. As they say, no stone was left unturned. With a list price of 158,000 yen or $1,913... these beauty's are outta my budget, but a man can dream right? That said... those lucky few getting their hands on these will be members of one very exclusive club. Those wishing to become club members inquire here. The rest of the Stevenson Overall line can be found at these fine retail locations. 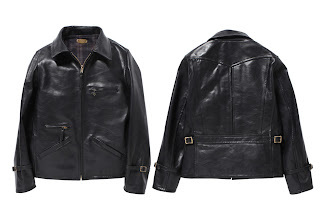 For myself, the name horsehide became synomonous with the quality and the many details mentioned above and discovered while searching for my first vintage leather jacket a few years back. Its great to see companies putting out the effort to both pay homage and refine these classic garments from yesteryear. 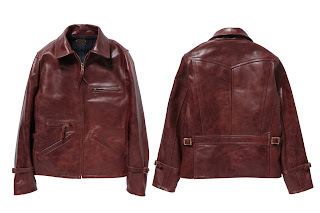 These super limited jackets just recently hit select stores in Japan, one thing contributing to their limited availability is the labor intensive nature of production performed at a small Japanese factory known for high quality leather goods, which I understand results in only one possibly two finished jackets per day. This jacket can be seen along with other Stevenson Overall Co. "Real Clothes for Real People" in MONO WORKWEAR #4 and check em out on Facebook for more info. I am always impressed with the quality and attention to detail that go hand in hand with this fine brand & company. A tip of the cap to Zip, Atsu, Nao & all the folks at Stevenson Overall Co. home of the appropriate slogan "Aero Brand, The Height of Perfection"... I couldn't have said it any better. This is the first of this months posts featuring friends, peers, and things to admire and inspire as we lead up to Inspiration 2011 Vol 2, "WE INSIST" at the world famous Queen Mary in Long Beach on Friday Feb 11th & Saturday the 12th. Stevenson Overall Co. will be one of the many great brands featured. We will be there having a great time and showing support to all our friends along with a big day Sunday the 13th at the Rose Bowl for The San Fernando Valley Mercantile Co. It's gonna be a HUGE weekend, we have some special things in the works that we can't wait to unveil and hope to see you all there! Thank you Warren for the very positive review of my Jacket and brand in General. I appreciate very much. Thank you very much for featuring our leather jacket and all the information. I am truly enjoying this blog.